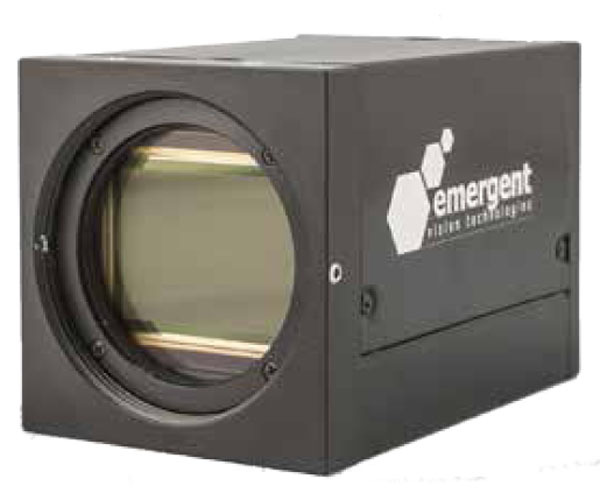 Emergent Vision Technologies HT-50000 is a 50MP 10GigE 10-bit digital vision camera using the AMS (CMOSIS) CMV-50000 CMOS sensor. 10GigE increases the bandwidth, which allows for high resolution, high frame rate & networking multiple cameras through a single connection. The 10GigE interface is GenICam and GigE Vision compatible. The HT-50000 has a multi-frame (5 frames 8-bit) memory buffer in the camera. Available in color or monochrome and various optional lens mounts. 10GigE (a.k.a. 10 Gigabit Ethernet) is the successor to 1GigE (1 Gigabit Ethernet), which became the leading interface for machine vision applications from about 2008 on. 10GigE, as the successor, provides all the same benefits of 1GigE but with a ten-fold increase in data-rate, which leads to a ten-fold increase in transmitted frame rate or image resolution. 10GigE, as with 1GigE, is a cross-industry standard, which has been around for many years and is managed/produced by the IEEE 802.3 working group. The 10GigE standard is the state-of-art technology in any modern office IT and used for the simultaneous transmission of Voice-over-IP (VoIP) telephone communication, video conferencing and other data. Thus Telecom providers, data processing centers, industrial control units as well as security and defense installations utilize 10 Gigabit Ethernet as their default communication technology. All Emergent 10GigE vision cameras are GenIcam and GigE Vision compliant. Ideal for the following applications: BGA and PCB Inspection, Fast Frame Imaging, Industrial Imaging, Machine Vision, Ordinance Testing, Research Design and testing, Aerial Imaging, large Aerial Surveillance of sport stadiums, Production Lines, Robot Cages or for Unmanned Aerial Vehicles.